Aloe Barbadensis Leaf Juice*, Purified Water (Aqua), Rosa Damascena (Rose) Flower Distillate*, Sodium Hyaluronate, Sodium Laurylglucosides Hydroxypropylsulfonate, Vegetable Glycerin, Plant Stem Cells (Alpine Rose, Malus Domestica, Solar Vitis) and BioActive 8 Berry Complex*, Rosa Canina (Rosehip) Fruit Oil*, Punica Granatum (Pomegranate) Seed Oil*, Soothing Complex: [Magnolia Officinalis Bark Extract, Boswellia Serrata (Boswellin) Extract], Biosaccaride Gum-1, Bisabolol, Amorphophallus Konjac Root Powder, Allantoin, Tocopherol, Aspalathus Linearis (Rooibos) Extract*+, Hibiscus Sabdariffa Flower Extract*+, Camellia Sinensis (White Tea) Leaf Extract*+, Phenethyl Alcohol, Ethylhexylglycerin, Rose Isolates, Vanilla Isolates, Pelargonium Graveolens (Rose Geranium) Flower Oil*, Citrus Aurantium Dulcis (Orange) Peel Oil*. Open packet and gently unfold sheet mask. Place soft fibre side on clean, dry face, adjusting eye, nose and mouth openings to fit. Remove sheet liner and relax for 10 to 20 minutes with mask in place. Peel fiber mask from face and discard. No need to rinse. Gently massage remaining hydro serum over face & neck. Single use only. 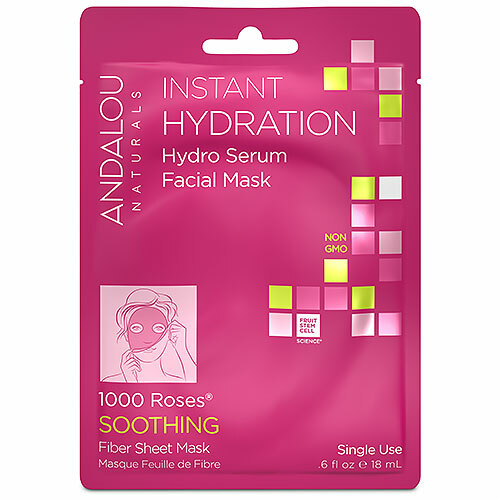 Below are reviews of Andalou 1000 Roses Instant Hydration Facial Sheet Mask - 1 Mask by bodykind customers. If you have tried this product we'd love to hear what you think so please leave a review.